Eugenie Bouchard said she was lacking confidence after being bounced from the Rogers Cup in the first round on Tuesday. And though she offered up a fairly simple fix to that problem — “win matches” — that’s been easier said than done for Canada’s top women’s singles player lately. Her latest setback, a straight-sets loss to 21-year-old qualifier Donna Vekic of Croatia, helped underscore that. Bouchard fell 6-3, 6-4 in the afternoon tilt on the Aviva Centre’s centre court. Vekic, playing in her main draw debut at the Rogers Cup, broke the Westmount, Que., native six times and won 17-of-27 first-serve points. Bouchard, who has dropped rapidly down the rankings from a career-high No. 5 in 2014 to her current spot at No. 70, started Tuesday’s match on the wrong foot. She was broken in the first game after a lengthy back-and-forth, then broken again to go down 3-0. Bouchard was 2 for 3 on break points during the first set but Vekic broke the Canadian four times, including the deciding game — a 10-minute long affair that saw the opponents hit deuce six times. She had 19 unforced errors to Vekic’s 10. The second set started better for Bouchard, who broke Vekic for a 2-1 lead, but she lost her next serve and responded by bouncing her racket off the ground in frustration. Each held serve over the next five games before Bouchard hit the net down 40-30 to give Vekic the match at 6-4. 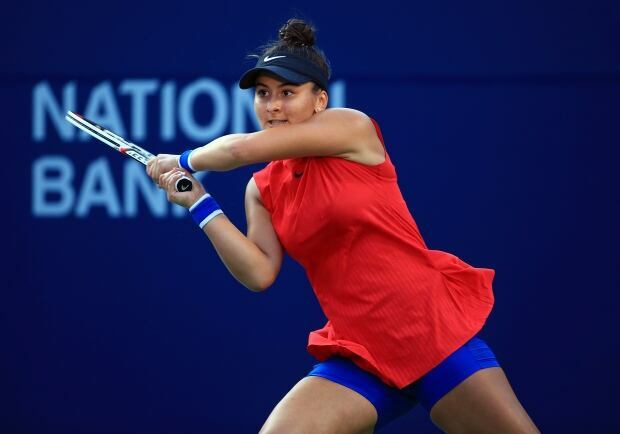 Mississauga, Ont., teenager Bianca Andreescu, coming off a quarter-final run at the Citi Open in Washington, D.C., last week, lost 6-4, 6-1 to 55th-ranked Timea Babos of Hungary in her Rogers Cup main-draw debut. The 17-year-old Andreescu, ranked 144th in the world, was the last remaining Canadian in the women’s singles draw. Montreal’s Francoise Abanda’s was ousted Monday night. Bouchard said before Andreescu’s match that she would welcome a successful run from the teen. Bouchard rose up the rankings when she reached the Wimbledon final in 2014 after two straight Grand Slam semifinal appearances. “I mean, I guess I’m relatively young, but I feel old in a way,” the 23-year-old said. “You know, I’ve been on tour a bunch of years already. And I think it’s important to feel the pressure of time a little bit, to get into action and not just relax and let years go by. That would be the worst thing I could do. Vekic won her spot in the main draw via a two-round qualifying tournament over the weekend. Bouchard was a wild-card entry in her seventh main draw appearance at the Canadian event. Her best showing at a Rogers Cup came last year in Montreal, when she lost to Slovakia’s Kristina Kucova in the third round. Less than two hours after losing her singles match, Bouchard won her first-round doubles match with World No. 1 Karolina Pliskova. The two beat Dominika Cibulkova and Kirsten Flipkens 6-4, 6-2. Teenager Bianca Andreescu of Mississauga, Ont., made her Rogers Cup debut in Tuesday’s night draw against Hungary’s Timea Babos. The 17-year-old is the last remaining Canadian in the women’s singles draw after Bouchard’s loss. Montreal’s Francoise Abanda’s was ousted Monday night. Bouchard said she would welcome a successful run from Andreescu. The 143rd-ranked Shapovalov survived four match points in a second-set tiebreak on his way to a 4-6, 7-6(8), 6-4 victory over the 64th-ranked Rogerio Dutra Silva of Brazil in the opening round on Tuesday. After dropping the opening set, Shapovalov’s margin for error was slim. The Richmond Hill, Ont., native’s comeback looked unlikely when he quickly fell behind 3-0 in the second-set tiebreak. He fired back-to-back aces to give himself a fighting chance. Down 6-4 — the first match point — Dutra Silva made an unforced error. Now 6-5, Shapovalov hit a clever drop shot just out of his opponent’s reach. On the third match point, Dutra Silva sent his backhand long. Down 8-7, Shapovalov hit his sixth ace of the set to fend off elimination for the fourth time. With the Canadian now in front 9-8, Dutra Silva double faulted to give Shapovalov the second-set victory. In the third set, Shapovalov fired four aces. He broke Dutra Silva to take a 4-3 lead in the set and never looked back. On triple match point, Shapovalov fired a serve that handcuffed Dutra Silva. The 18-year-old dropped his racket and threw his arms in the air as the centre court crowd at Uniprix Stadium erupted in cheers. 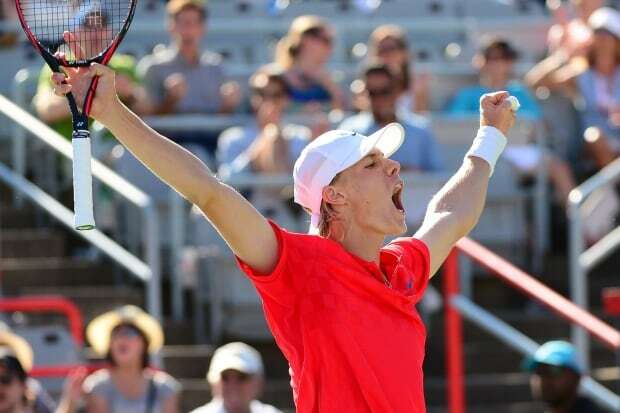 It’s the second straight year that Shapovalov has advanced into the tournament’s second round after beating Nick Kyrgios during his opening match in 2016 in Toronto. The win is Shapovalov’s first on hard court this year (1-3). It’s also just his second victory on the ATP world tour in 2017. He’ll now face Juan Martin del Potro of Argentina, ranked No. 31, in the second round. Earlier in the afternoon, South Korea’s Hyeon Chung upset Feliciano Lopez of Spain 6-1, 4-6, 7-6(3). Chung, ranked No. 56 in the world, took advantage of several mistakes made by the 28th-ranked Lopez, including eight double faults, to win the two hour 16 minute match. The opening match on centre court at Uniprix Stadium was supposed to feature 10th-ranked Tomas Berdych but he pulled out with a rib injury. Berdych’s withdrawal ended a streak of 12 consecutive appearances in Canada for the Czech player. No. 85 Ernesto Escobedo took his spot and upset 63rd-ranked Nikoloz Basilashvili in straight sets 7-6(4), 6-4. In the final match of the day, third-seeded Dominic Thiem was upset in the second round by Diego Schwartzman. Schwartzman took it 6-4. 6-7, 7-5 in a match that needed two hours 55 minutes. Thiem is the highest-ranked player at the tournament to be eliminated so far. Also, American Jack Sock downed Pierre-Hugues Herber 7-6(4), 6-3 in first-round play while fellow American Jared Donaldson beat Benoit Pare 6-2, 7-5 in the first second-round match of the tournament. Borna Coric easily defeated Mikhail Youzhny 6-2, 6-4 to set up a meeting with Rafael Nadal in the second round. Paolo Lorenzo downed American Frances Tiafoe 7-6(3), 0-6, 6-2. American Sam Querrey avoided an upset, rallying to beat qualifier Vincent Millot of France 4-6, 7-6(4), 7-5. In doubles, Canadians Vasek Pospisil and Daniel Nestor lost 4-6, 6-4, 10-2 to Spaniards David Ferrer and Roberto Bautista Agut. Milos Raonic from Thornhill, Ont., was initially scheduled to play his opening match on Tuesday but a minor injury forced him to postpone it to Wednesday. He faces France’s Adrian Mannarino.